Our pets are our most faithful companions, especially in the outdoors, where they love to play and explore just as much as we do (if not more). But whose pet garners the most trailside oohs and ahhs? 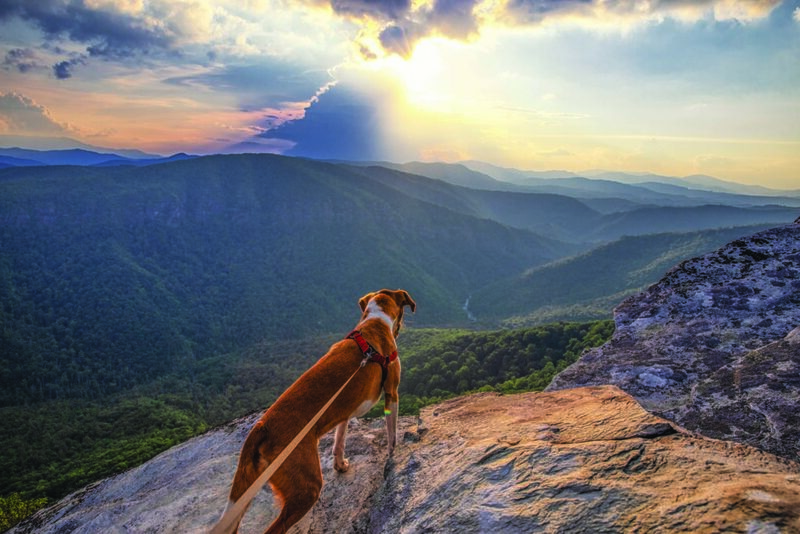 To determine that, we asked you to post photos of your pets in our Adventure Critters contest on the Blue Ridge Outdoors and Elevation Outdoors websites. We then asked our readers to vote for the winners. Of note: This year we opened the contest up to include more than dogs. And although a hedgehog made an impressive run and some cats meandered into the fray, dogs came out on the top of the pile. Maybe next year an iguana will break into the big time, but for now, here are those outdoor canines you loved best. Human Justin Potter says: Cramer is my foster failure. He has always been scared of people and dogs, but I’ve slowly been getting him used to the outdoors and finally took him camping. He loved it! Sharing my adventure with a dog who has had so many issues has given him purpose. Plus, he fits perfectly in my Nemo two-person tent. Favorite Adventures: Exploring the ridgeline above the Linville Gorge. He can’t get enough of looking over the edge and down to the river below. Why Cramer’s a Great Companion: Ever since I first adopted Cramer, we’ve shared a very special bond. I love taking him to my favorite places in the Blue Ridge Mountains and that I got to see the smile on his face the first time we went together. Up next? A trip up to the Roan Highlands along the Appalachian Trail. Human Courtney Orr says: Having a pet to go on adventures with is wonderful. Dallas enjoys hiking and adventuring just as much as his momma does. I have a job that can be stressful, so, on my days off, I’ll load Dallas up in my Jeep and we’ll go wherever the road takes us. When I’m outside with him, whether it be climbing a mountain or just going for a swim, he takes all my stress away. Just seeing those big hazel-green eyes look back up at me and watching his nub of a tail wagging melts my heart. Favorite Adventures: He loves splashing around in waterfalls. 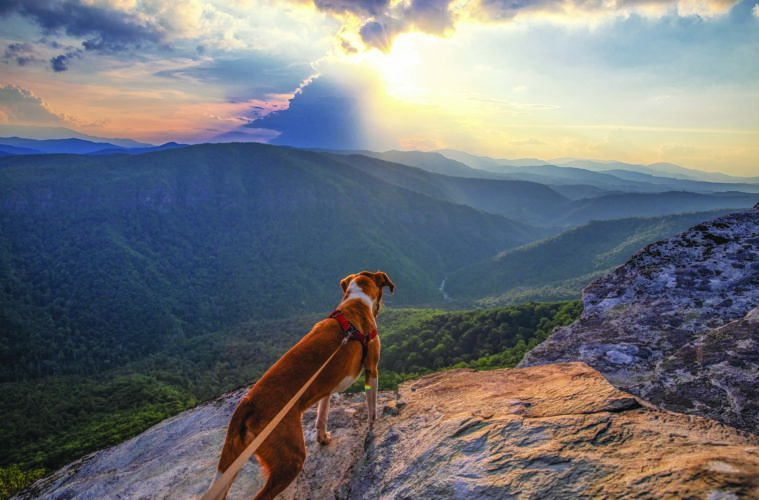 Why Dallas Is a Great Companion: When we’re out on a trail and he sees someone or another dog, he always says, “Hello!” So if you ever see us on a trail in the North Carolina mountains, don’t be afraid to say hello back. I know Dallas would love that! Up next? I’ve been planning a huge road trip out West. Human Kelsey Long says: Missy makes me feel safe, so that I can see the beauty nature has to offer. In the past, I was not an outdoors woman because I could only see the dangers in the wild, but she has shown me it’s all not bad. Favorite Adventures: The adventure in which this photo was taken at at Heavener Runestone Park in Oklahoma. We spent the week in a cabin on the lake in January. While I was freezing, she was in her element. We spent hours on the trails, only limited by the amount of supplies I stuffed in my backpack. Why Missy Is a Great Companion: She’s cute, obedient, loyal, smart, a good listener and loves the outdoors. Up next? Getting “lost” in the mountains in Tennessee. 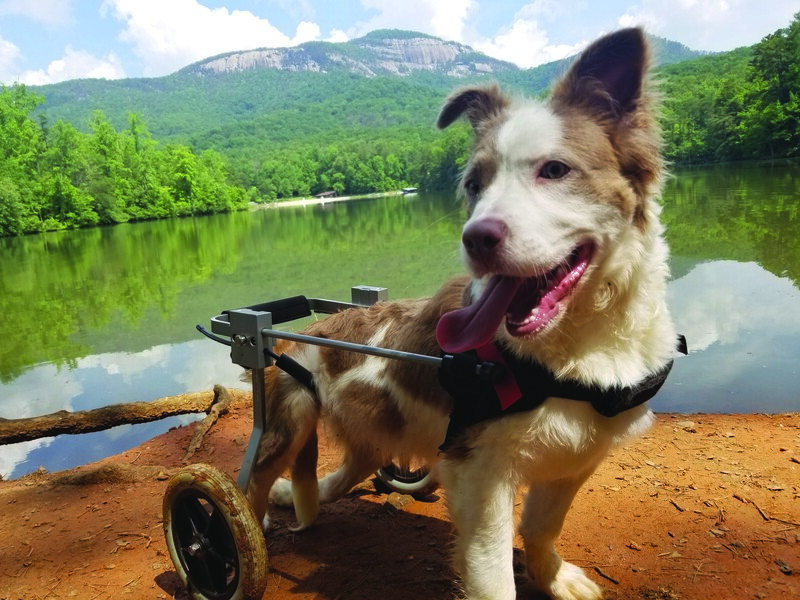 Human Heather Powers says: Meadow is an eight-month-old Aussie shepherd found on the side of the road with a broken back, so she needs to walk in a wheelchair. There’s a companionship with a pet that’s something you just can’t get with another human. They have their own special way of “talking” to you, without saying a single word. Favorite Adventures: While Meadow is down for any adventure, she is thrilled when that adventure involves water—lake, river, pond, stream, heck even a puddle. Why Meadow Is a Great Companion: Nothing holds Meadow back. She has a zest and love for life. She even has a built-in handle in her wheelchair so I can to assist her when she climbs up a mountain. She shows me and everyone else she comes in contact with that you can’t let anything hold you back. Up next? 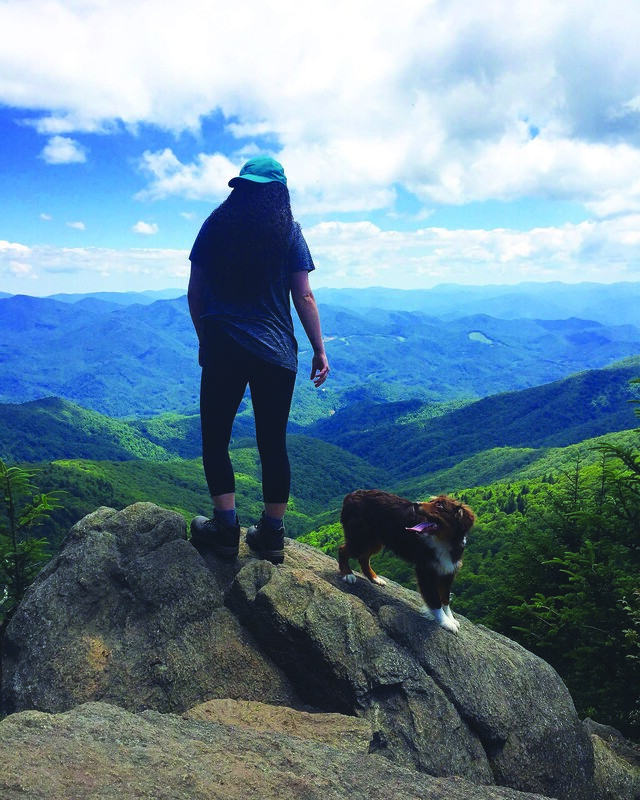 Her main goal is to complete a section hike of the 77-mile long Foothills Trail in the Carolinas. We might even include an overnight or two. 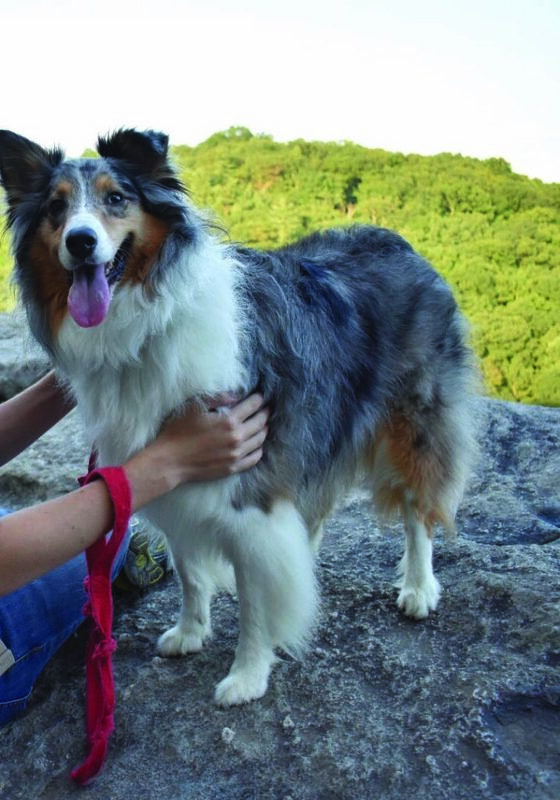 Human Kelly Kolson says: Biscuit is half Australian shepard and half Shetland sheepdog. Her eyes are multicolor—each one a swirl of brown and blue. She makes life better inside, outside and everywhere overall. Pets live in the moment and they are happy to be exploring or just chilling together. 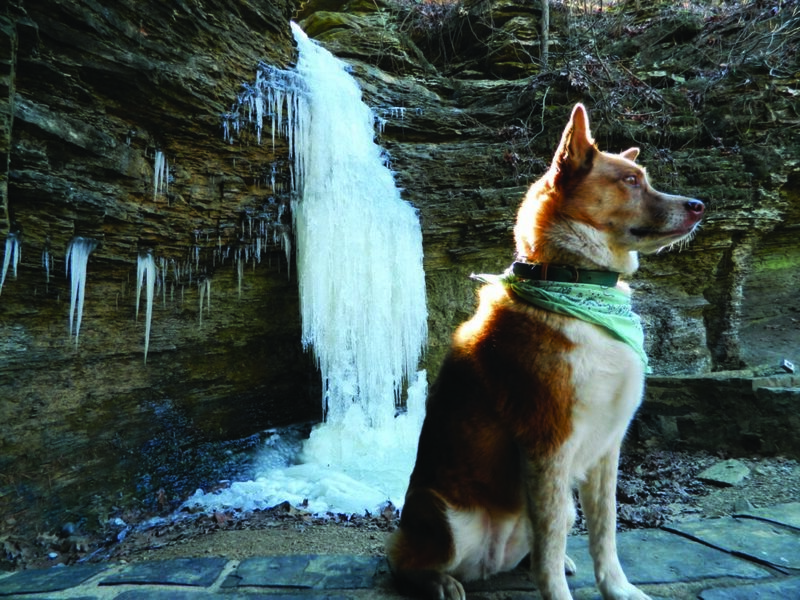 Favorite Adventures: Biscuit loves swimming along next to kayaks (sometimes deciding to climb onto the stern and capsize them), leading her family on hikes or cautiously exploring a local rock outcropping. Why Why Biscuit Is a Great Companion: She likes to keep a watchful eye on everyone and launches into action to herd companions who get too far ahead. Up next? We plan to go everywhere and anywhere we can together.